The technology used in neurosurgery is changing all the time. The neurosurgeons of Neurosurgical Consultants, Inc., Drs. Freed, Friedberg, and Gieger attend continuing educational courses on a regular basis and bring these changes into their practice of Neurosurgery. The use of magnification and special lighting during surgery is an "everyday" routine for these neurosurgeons. The operating microscope used by Neurosurgical Consultants is a late model microscope offering excellent optics, lighting and zoom magnification from 6X to 12X. The controls on the microscope are all motorized for precision and ease of use. Stereotactic surgery is minimally invasive surgery with extreme accuracy. It is the computerized link between a CT Scan or MRI Scan to the equipment used in the operating room. With a stereotactic technique, neurosurgeons can precisely place a needle into a very small lesion or tumor with an accuracy of one millimeter. Dr. Freed has been performing stereotactic minimally invasive brain surgery since its beginning in the early 1980's. Drs. Friedberg and Gieger had extensive training in this technology prior to joining the practice in July 1999 and December 2008 respectively . 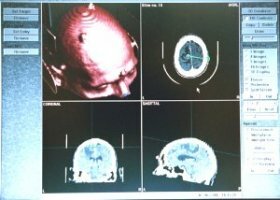 Neuronavigation,, is the application of 3D views of the patient's brain or spinal cord that are linked by computer to the instruments used during surgery. It includes stereotactic surgery. 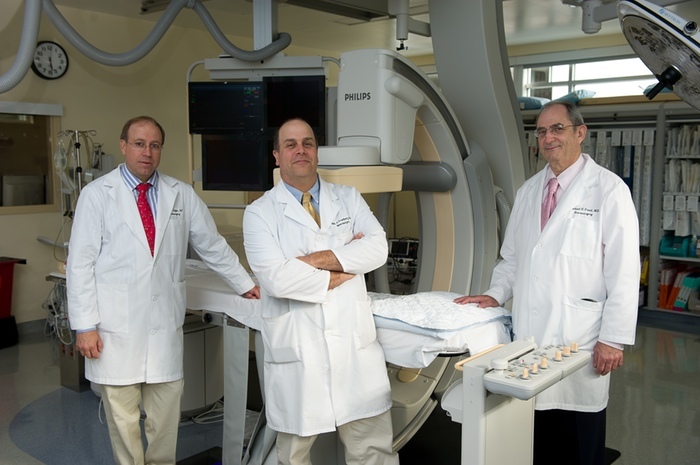 The acquisition of a BrainLab Neuronavigation System at the Steward Norwood Hospital has allowed the neurosurgeons of Neurosurgical Consultants, Inc., to stay in the forefront of this rapidly changing field. Spinal Fusions are not new to neurosurgeons. However, the development of metal (usually light weight Titanium) plates, rods and screws allow neurosurgeons to "lock" the bones in place. This allows for quicker healing. We now have in our armamentarium devices that maintain the height of a disc space after removal of the disc. These interspace "cages" come in different shapes and sizes. Some are made of Titanium, others come from donor bone. The uses of these devices and grafts has allowed for much shorter and easier lumbar fusion operations. Patients have less pain, ambulate sooner and are usually able to leave the hospital on the second postoperative day. Some techniques incorporate Neuronavigation to place the devices with greater accuracy and less risk than ever before. Makers of these devices include Medtronic and Globus Medical, and others. Pain control often falls into the discipline of Neurosurgery. There are now numerous Implantable devices used to control chronic pain. These include implantable pumps that constantly deliver medication into the spine and stimulators with electrodes that lay over the spinal cord. Both of theses implants block the sensation of pain before it gets to the brain. The doctors of Neurosurgical Consultants, Inc. are well versed in the latest pain implant technology. There are several vendors for these implants. Our most common supplier is Medtronic. Vertebral Compression Fractures are common problems for people 60 years and older. These fractures are very painful and often debilitating in this age group. Because these patients often have osteoporosis the fractures do not always heal well. The deformity in the bone can progress and lead to breathing and walking problems. In the past, the surgical treatment of spinal compression fractures involved long complicated operations with implantation of metal hardware. For a variety of reasons, many of these patients could not tolerate or benefit from this extensive surgery. Also, the recovery was long and difficult. We can now stabilize these fractures with a minimally invasive technique called Kyphoplasty. Through one or two small (5 mm) incision(s) on the back, a catheter with a balloon, called "KyphX Inflatable Bone Tamp", is passed into the fractured vertebrae under x-ray guidance. After expanding the balloon (and the bone) plastic cement is injected into the cavity to stabilize the bone and relieve pain. Patients are often ambulatory the next day and out of the hospital in one to two days. The balloon devise is manufactured by Kyphon. For more information, please click on: "Evaluation and Treatment of Vertebral Compression Fracture." Neurosurgeons often use CT Scans to make urgent diagnoses and plan treatments for patients in the emergency room and at other times. "Teleradiology" is the technology that allows physicians to see CT Scans, MRI Scans and other imaging studies from a remote location. Our office computer is available to view such images from Caritas Norwood and Caritas Good Samaritan Hospitals. During off hours, this technology is also available to the "on call" physician. Soon after an emergency CT Scan has been completed and we are notified, the neurosurgeon can access the scan, review the images and advise the treating physicians and nurses at the hospital on the best treatments for these often critically ill patients. If surgery is indicated, the preparation of the patient and the operating room gets underway, even before the neurosurgeon arrives at the hospital. This time saving can make a big difference in a patient's outcome. Electronic Medical Record (EMR) keeping systems are now present in many doctorsÃƒÂ¢Ã¢â€šÂ¬Ã¢â€žÂ¢ offices. They provide instant access to the all the parts of a patient's "chart." No longer must the paper chart be found before a question can be answered or prescription refilled. In addition to the obvious improved efficiency, patient privacy is maintained better than ever before. Neurosurgical Consultants, Inc. was one of the first practices in its coverage area to implement an EMR, in 2002. The electronic medical record solution used by Neurosurgical Consultants, Inc. is provided byAllMeds and meets all HIPAA requirements for privacy. Copyright © Neurosurgical Consultants, Inc. 2000-2012 All rights reserved.